Top Gun was one of the biggest grossing movies in 1980s starring Tom Cruise, Val Kilmer, and Kelly McGillis. The movie revolves around naval aviator LT. Pete Mitchell better known as Maverick. Maverick lost his father in Vietnam War, in circumstances that made him feel slightly ashamed for his father. In an attempt to prevent others labeling him as a failure, Maverick became a dare devil, with no regard to team work. The tendency to be reckless in flying the fighter air crafts was his way to vindicate his father’s failure. This underlying psychology continued even when he is sent to “Top Gun” school. He, however, lost self confidence when his recklessness caused the death of Goose the Radar intercepting officer. However, despite such tragedy, Maverick was cleared of charges, but he ceased to be as aggressiveness as before. He even contemplated retirement. Before retiring, however, he spoke to his CMDR “Viper” who told him that his father actually died heroically. This information made Maverick continue his training at Top Gun. In crisis situation that followed, Maverick exhibited tremendous presence of mind and succeeded in shooting down hostile air crafts, which earned him accolades and choice of assignments. Maverick opted to become an instructor at Top Gun. 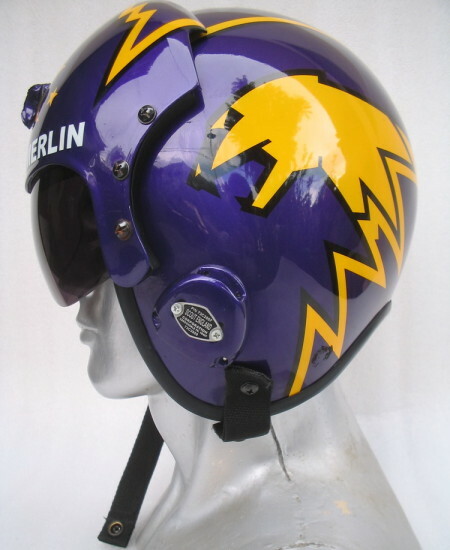 Top Gun has spurred usage of helmets identified with the names of the characters in the movie. 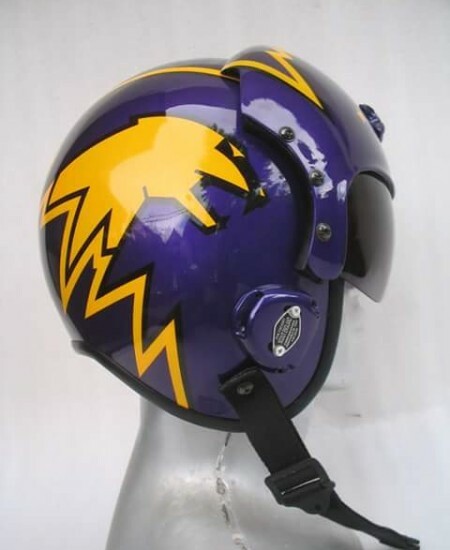 The helmets worn by Tom Cruise, Val Kilmer, and others in the movie were replicas of authentic flight helmets, especially helmets worn on F-14 HGU-33. “Top Gun” helmet replicas have the names of the characters displayed on them and they are painted in stripes or may have other paintings or designs on them. There were no such names on the helmets that were worn in the movie. These helmets also resemble the shapes and sizes worn in F-14 in the film. Therefore, these replica Top Gun helmets include those with Maverick, Goose VF-1, Iceman, Jolly Rogers, or Charlie painted on them. 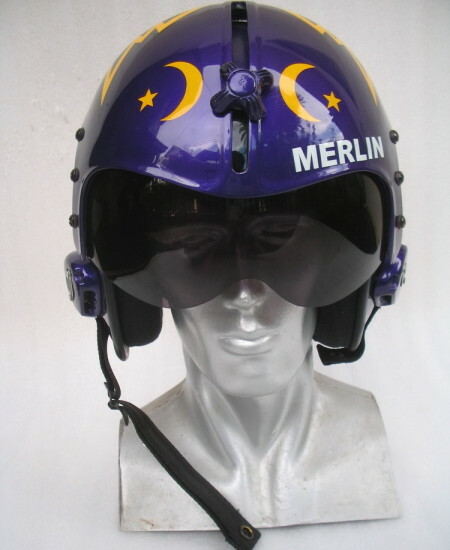 Top Gun Merlin Replica helmet for example was worn by LT JG Sam Merlin portrayed by Tim Robbins. 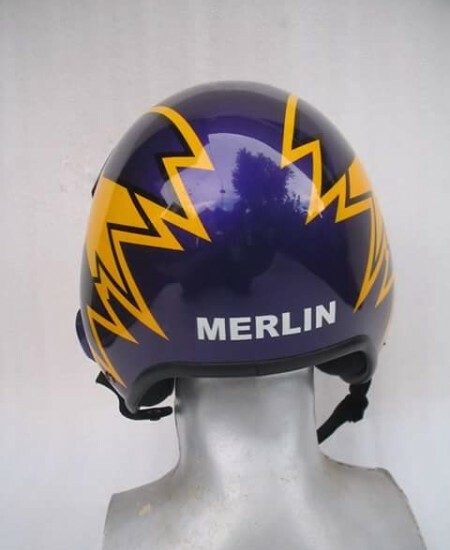 The helmet is dark purple in color with the name “Merlin” on it. These helmets are also covered with “reflective” tapes that are actually used by naval aviators in the US. Such covering with reflective tape gives the helmets an authentic appearance. These helmets are large and have their characteristic shape, i.e., spherical shape which differentiates them from other helmets. Such helmets and gear have become collectibles now. Some of the replicas are used at Halloween time. These are made from ABS fiberglass of high density. Usually, these visors are black in color, but these are nevertheless clear.